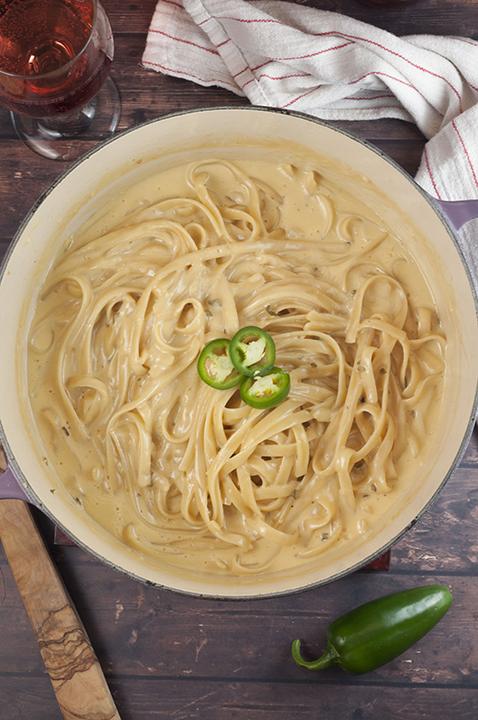 One Pot Creamy Jalapeño Popper Pasta recipe is easy enough for a weeknight meal with just the right amount of spicy flavors, creamy cheese sauce, and gooey cheese! I am on a serious pasta kick lately. If you are asking yourself how this is different from my everyday life…you are correct. It is, in fact, not any different. I have found an awesome pasta dinner to add to my recipe rotation and am so excited to share it with you all today. 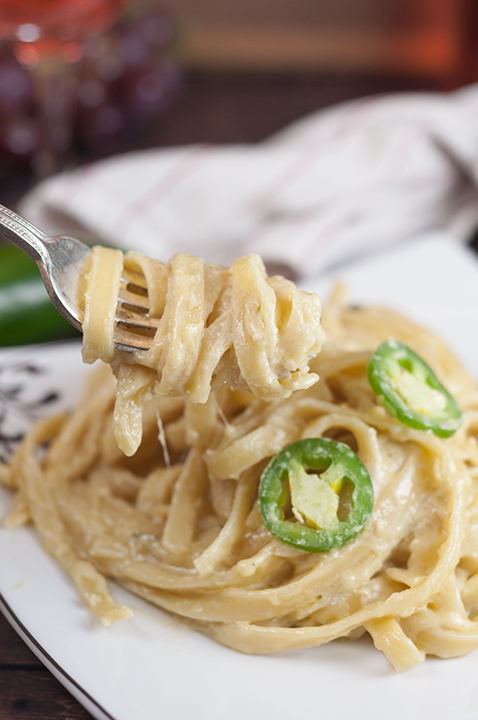 So, let’s talk Creamy Jalapeño Popper Pasta, shall we? This post is sponsored by Sutter Home for the #SweetonSpice program. 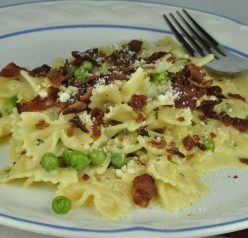 There’s nothing quite as wonderful as the richness of a hearty, creamy pasta dish. 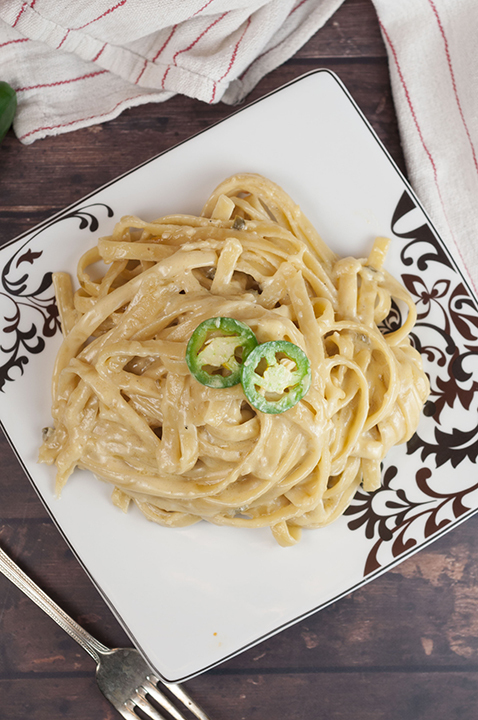 It may not be an everyday dinner because of the richness, but when the occasion comes where a craving arises for perfectly al dente noodles in a decadent cream sauce, nothing else will do. I added just the right amount of heat to this pasta, but wanted to keep the rest of flavors simple because the jalapeño peppers add so much flavor on their own. I love spicy food because I prefer strong flavors in my food, and this meal really has the perfect amount of spice. Though it is a bit spicy, it won’t make you feel like you’re eating the sun – I promise. Feel free to add some extra spice or take some away according to your liking! 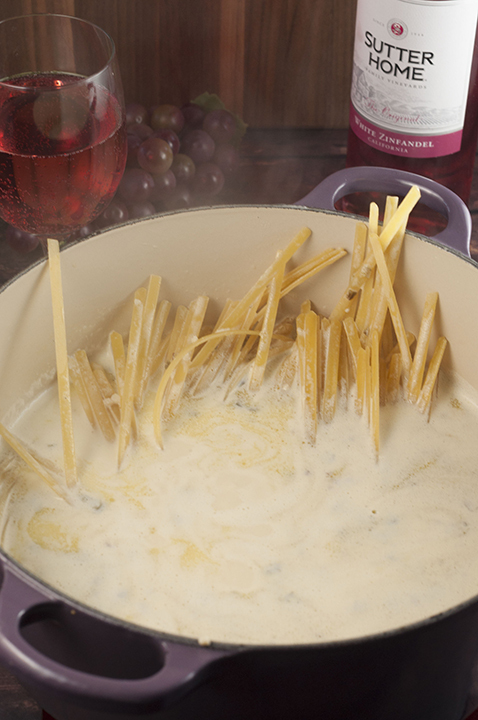 The only thing better than a good pasta dish that only messes up one pan is a good wine to go with it, am I right? Lucky for me, my friends at Sutter Home hooked me up good with a few bottles of their White Zinfandel to enjoy with dinner. Do you want to know what goes perfectly with this spicy dish? I’ll give you a hint – it’s Sutter Home’s White Zinfandel! I’ve always been a big fan of their wine so I was so thrilled to be asked to participate in their “Sweet on Spice” campaign. The sweet White Zinfandel with a good, spicy meal is really a match made in heaven. 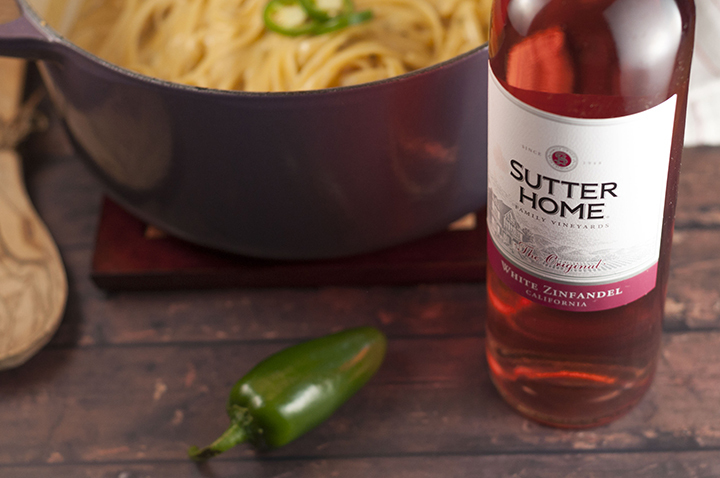 The spicy pasta dish pairing perfectly balances the heat of the pasta dish with the sweet, refreshing Sutter Home White Zinfandel. The wine really brings out the flavors and perfectly complements the pasta dish! 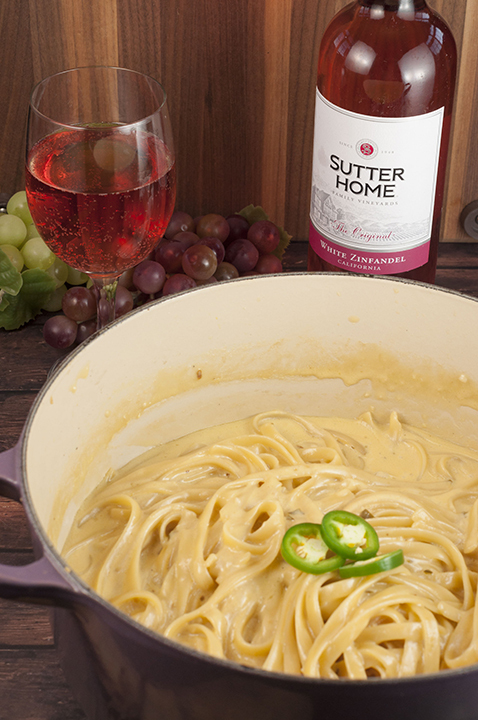 The Sutter Home White Zinfandel went perfectly with this One Pot Creamy Jalapeño Popper Pasta, but I’m thinking it would also go very well with a good Asian or Mexican meal that provides a nice burst of heat. Sweet and spicy together may just be my new favorite foodie pairing! Their White Zinfandel is a crisp, refreshing American classic wine with a medium level of sweetness. I love the taste with the delicious note of strawberries and melon! 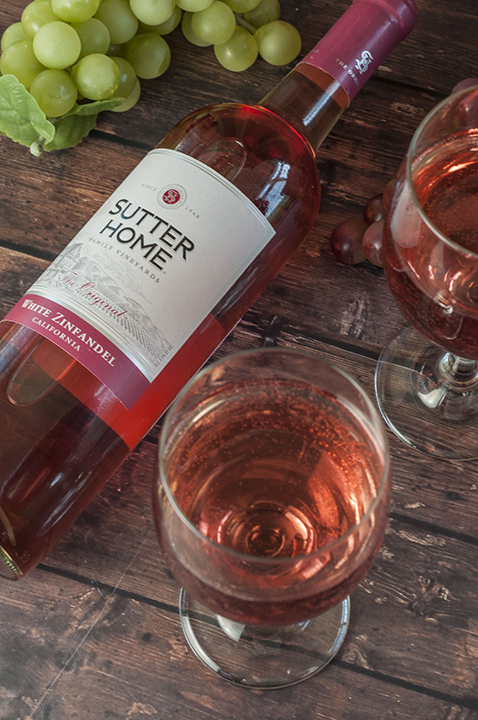 Fun fact: Sutter Home revolutionized the way Americans enjoyed wine when they created the very first White Zinfandel! This introduced a new, sweeter style of wine at an affordable price, among many other varieties of wine! Sutter Home became a household name by the 1980s and 1990s as the second largest independent, family-run winery in the United States. This meal is SO easy to make, is a crowd-pleaser, and you won’t end up with a lot of dishes to wash at the end of the night. That is a win in my book. This is exactly how to enjoy a weeknight meal or dinner for a special occasion when you want to impress people. It’s ridiculously easy and dinner guests will think it took you all day to make. It’s definitely the ideal meal if you’re short on time but want something ridiculously delicious. Make sure you try it soon because it’s sure to become a new family favorite! And don’t forget to drink a glass of Sutter Home White Zinfandel along with it. You deserve it! Cheers! One Pot Creamy Jalapeño Popper Pasta recipe is easy enough for a weeknight meal with just the right amount of spicy flavors, creamy sauce, and gooey cheese! In a heavy-bottomed pot (I used my dutch oven) or deep skillet, add olive oil and heat over medium heat. Add jalapenos, sautéing for about 2 minutes, stirring frequently. Add garlic and saute for 30 seconds or until fragrant, stirring frequently, being careful not to let it burn. Add cream, butter, chicken stock, salt, pepper, and red pepper flakes; stir to combine. Add in the uncooked pasta. 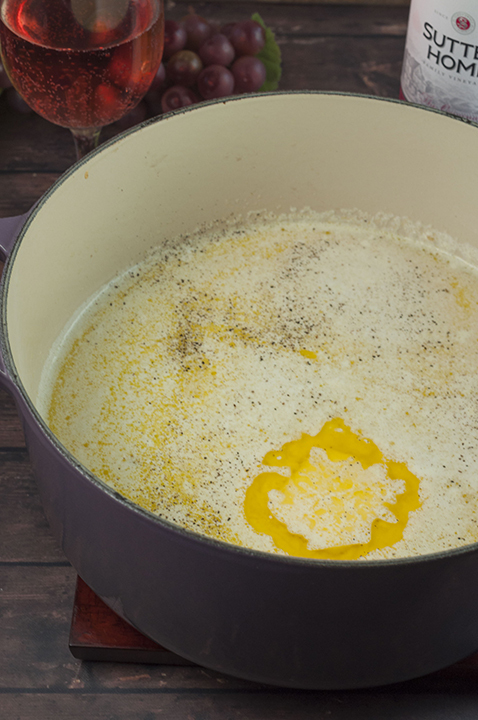 Raise heat to medium-high, and bring to a boil, stirring the pasta occasionally so it doesn't stick together. Once at a boil, reduce heat to low. Cover and simmer for 20-22 minutes, stirring occasionally. When the sauce has thickened and the noodles are just cooked (not mushy), remove from heat. Add both cheeses and mix until combined and pasta is coated. Add additional salt & pepper, to taste. Sprinkle fresh parsley on top. Serve hot. Enjoy! Disclaimer: This post was brought to you by the makers of Sutter Home. I received compensation to write this post through the #SweetOnSpice program. All opinions expressed are 100% my own, as always. Girl, this meal is calling my name! Haha! Try it soon – it’s so yummy! 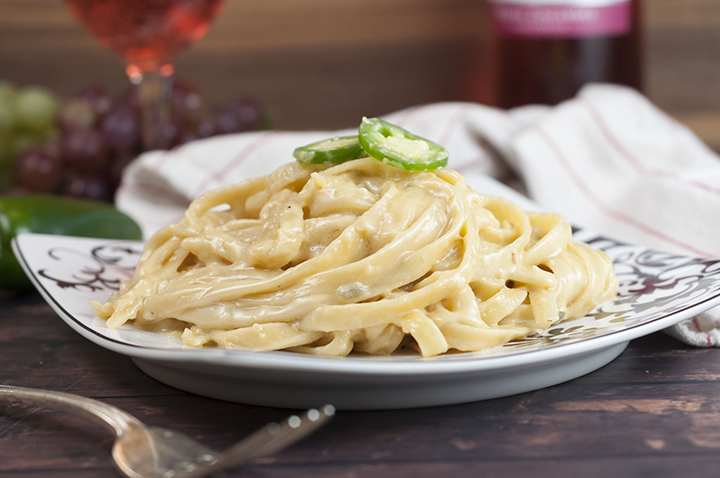 I love the spicy jalapeno kick against the creamy pasta…and with a glass of white zin – such a heavenly meal! Yes – they go so well together! Thanks, Martha! oo now that’s my kinda dinner! Thanks, Angie! Try it soon – you’ll love it! Thanks, Nettie! Sutter Home is awesome! 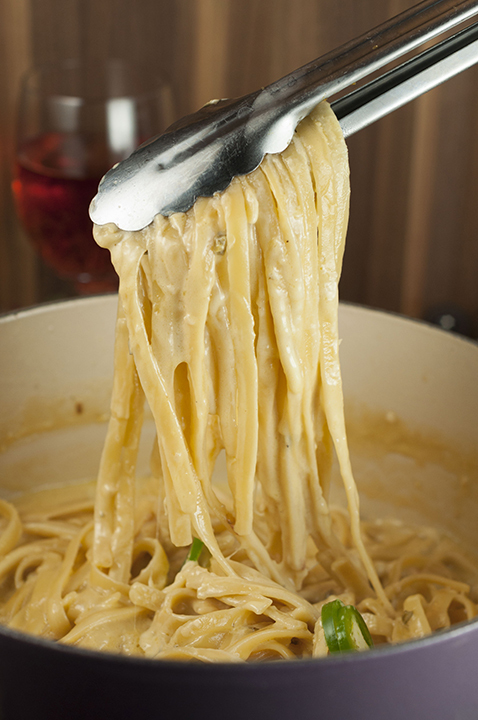 Great wine choice with this spicy, creamy pasta dish! Thanks, Lori! It went perfectly with the spicy dish! Thanks, Rebecca! It IS fun! I have GOT to try this pasta! I love the kick from the jalapenos and the juicy flavor from the wine! The flavors in this are amazing! Thanks, Hayley! This looks so good, and so simple. I love pasta with some spiciness, but my husband….not so much. This seems like it might offer a good balance that we both could enjoy. Also, I love me some Zinf! Jenn, awww thanks! It’s one of my new favorite meals, for sure. Yum!! 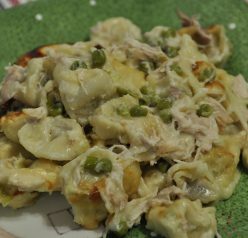 I love a creamy pasta dish! Thanks, Jessica!! So do I! Oh my goodness this looks so good! I love pasta. I love cream sauce. I love spice. Cannot wait to try this!! 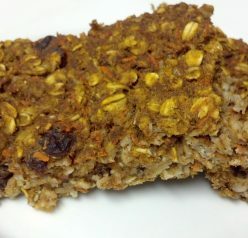 This would be amazing with gluten free pasta! This looks absolutely delicious, I can’t wait to make it this weekend!! This looks like the perfect pasta dish! Jalapeño? I’ll never say no! And what a neat addition to a classic recipe. Pure genius — thanks. Yum! These are flavors I crave! And a glass or two of with…with?? Yes please! This is making me drool, big time! If I take one bite, I will not be able to stop. Looks so creamy and decadent. I just love pasta and every once in a while, it’s great to treat myself to something like this. Looks amazing! I recently discovered the awesomeness that is one-pot pastas (yes, I know… I’ve been living under a rock for the last year, apparently), and I’m loving the sounds of this creamy-spicy version. Bet it would be a perfect date night treat, especially paired with that wonderful wine! can’t wait to try!! Do I use shaved parmesan shredded or grated? I used grated! Enjoy, Lyndsey!